In this example, we are showing how a file can automatically quit at a predefined date. We have also built in a backdoor so that we can open the file even if the date range has passed. By default, we have set the turn off date to be 1/1/2005. We have included a button that will set the turn off date to one day minus today ( yesterday ). Click the button and then click the button below it to test. We have also used the Get(ActiveModifierKeys) function to build in a back door that will bypass the deactivation script. 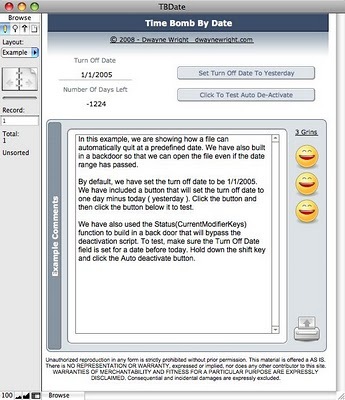 To test, make sure the Turn Off Date field is set for a date before today. Hold down the shift key and click the Auto deactivate button.